Blasphemy? Idolatry? Or a conduit to greater wisdom and healing? 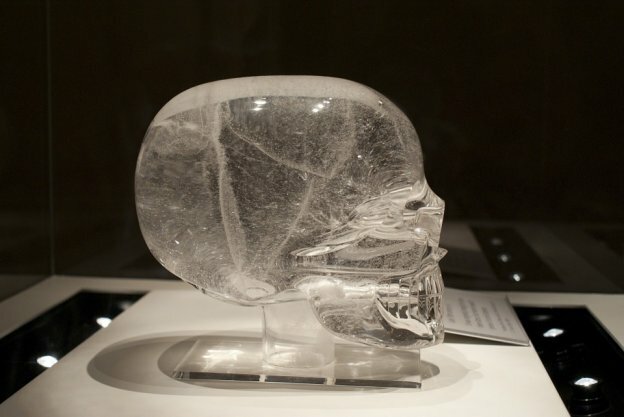 Crystal skulls and the controversial legend surrounding them have fueled every possible emotion among religious scholars, archeologists, the scientific community, new age spiritualists, and even Hollywood. Most people’s exposure to the skull’s legend is limited to the Spielberg / Indiana Jones spin, melding the perceived telepathic power of thirteen ancient quartz skulls to a 1957 cold war power struggle with the Soviets. Scientists who have researched the phenomenon generally refer to the skull’s prominence in Aztec legend as representations of various gods, with no other specific powers. They also point to evidence that, in some cases, would invalidate their alleged ancient origins. Still, the modern-day preponderance of well-manufactured skulls does tend to support the evidence against skulls being of ancient origin or containing unique powers. In fact, thousands are produced annually from many types of stones including clear quartz, hematite, selenite and rose quartz, primarily in South America and China, for collectors. Despite the conundrum and the strength of scientific evidence, many still seek out or are drawn to certain skulls for perceived telepathic powers. When all reasonable explanation is stacked against crystal skulls being nothing more than a form of art, the question becomes, “why do those whose adamant belief in the mystical aspects of these unique crystals, believe? What miracles might they have encountered to risk ridicule by making their beliefs known? What wisdom might they have learned? The journey we are about to take will answer some of those questions. The crystal skulls that we will focus on, are cared for by a Reiki Master healer who runs a metaphysical center, teaching healing classes and meditation. She was gifted the three skulls by a friend who had also served as a guardian in the same environment for over 30 years before her passing. She, in fact, had received them in the same way, so the origin of the skulls is unknown. So, the skulls have been involved in decades of group meditations to balance the energies. According to the current guardian, each skull seems to accelerate specific telepathic and healing abilities with many of those who come in contact with them, which in part, supports Shapiro’s theories. But now, in 2019, they have asked for a greater voice and it appears, they have a story to tell. Over a series of group meditations, whose ten participants were drawn to be involved in this experiment, we will do simply what is intended in each meditation experience. That is, we will listen. If you are looking for scientific proof for the answers and revelations we hope to find, this journey is not for you. Rather, we are about to embark on a metaphysical investigation – a series of telepathic interviews, with a focus on allowing whatever wisdom may be available to come through. No double-blind studies. No search for validation, although validation may well occur. All that is required is an open mind and faith. The first interview will be released soon and we think you will be amazed. Be prepared to meet Moe.